This course is intended for people interested in bringing digital fabrication and making to educational contexts. 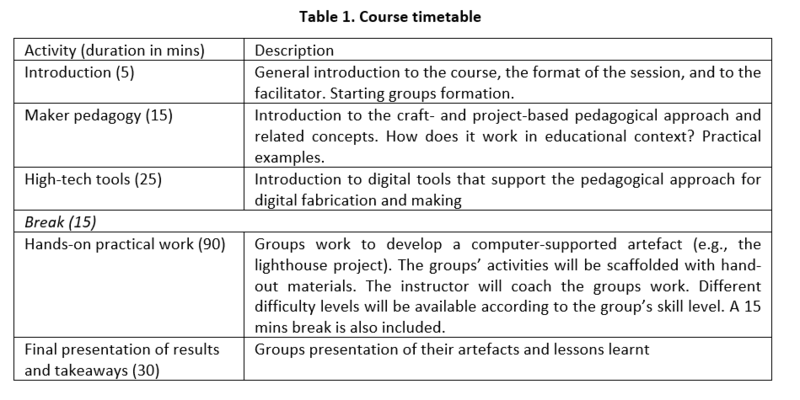 The course introduces a five stages craft- and project-based pedagogical approach alongside supporting low- and high-technology tools to bring about the eCraft2Learn learning ecosystem. During the course, through hands-on activities the participants will familiarise with the pedagogical methodology and the digital platform created to support it. The course is suitable for novice participants with interest in digital fabrication and making in education, researchers and educators alike working with 13-16-year-old learners in makerspaces or in formal classroom environments. The course is based on practical educators training experience, using material generated to introduce the eCraft2Learn learning ecosystem to educators in Finland and in Greece. LO_I – To familiarise with a craft- and project-based pedagogy. The participants will be introduced to the pedagogical approach to digital fabrication and making developed from inquiry-based and design thinking (cite edurobotics calkin). LO_II – To familiarise with the digital platform created to support a craft- and project-based pedagogy. The participants will be introduced to openly available digital tools. LO_IV – To understand how to scaffold students’ self-regulation during digital fabrication and making activities. The participants will be introduced to best practices drawn from practical experience. LO_V – To understand how to integrate digital fabrication and making within educational activities with learners, e.g., within the eCraft2Learn learning ecosystem. The course is intended for practitioners, researchers and educators interested in familiarising with methods to introduce digital fabrication and making into educational activities with learners. The course is delivered at an introductory level, and so there are no prerequisites. However, knowledge of or experience with graphical programming environments (e.g., Snap4Arduino) may facilitate the development of the hands-on some activities. The content of the course includes the introduction to the craft- and project-based pedagogical methodology, presenting a five-stages process: ideation, planning, creating, programming and sharing. The theoretical background as well as the practical implementation of the pedagogical approach and supporting low- and high-technology tools will be presented. Hands-on activities to familiarise the participants with the practical implementation of the pedagogy within educational activities will be carried out. The main objective of the course is to offer participants an introduction to a systematic and practical approach for bringing digital fabrication and making to the educational arena. 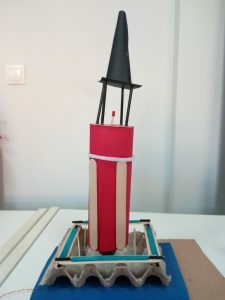 Practical projects examples will be carried out (e.g., creating a lighthouse as in Fig. 1) using the pedagogical methodology and tools introduced. The course will be carried out within a three-hours session as described in Table 1. Calkin Suero Montero is an Assistant Professor at the School of Educational Sciences and Psychology, University of Eastern Finland. She is the Coordinator and Principal Investigator of the eCraft2Learn project, a European enterprise involving 12 academic and industrial institutions across 6 EU countries to develop a learning ecosystem based on a solid pedagogical approach to facilitate STEAM learning through digital fabrication and making.